Want to get the most of your iPhone or iPad? Then consider getting some of the accessories available in the market. Not sure what to get? We are going to help you with that. Here are some of the best accessories for your iPad and iPhone. With the help of these accessories, you can do a lot of activities on your devices, more safely and efficiently. Check out the compatibility with your specific iPad or iPhone model while buying any of these. 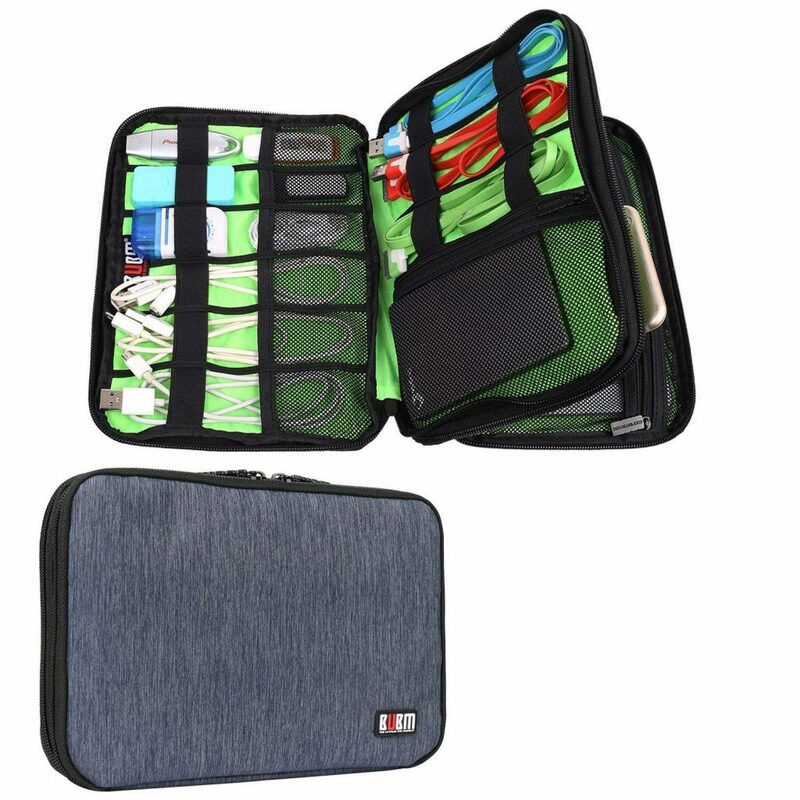 Check out this waterproof double layered travel bag for carrying electronic accessories to use with your iPad Mini and iPhone. It is lightweight but sturdy, made of durable, waterproof nylon that includes flexible covers that come with protective pads. There are several mesh pockets and loops, allowing a lot of flexibility in its use. It brings a nice and soft feel due to the waterproof nylon use. There are multiple layers that offer sufficient storage capacity. You can place various iPhone and iPad accessories, such as chargers, headphones, SD cards, memory SD cards, Kindle, mini cameras, laptop adapters and so on. The dividers are padded and you can adjust the main part to fit different needs. The mesh pocket is suitable for holding cards, as well as your iPad or iPad Mini. The zippers are sturdy and can secure the case effectively. There is a double zipper, which makes it easy to open and close the organizer bag. The dimensions of this bag are 9.8 x 5.9 x 2 inches. It is compact and can easily be kept in your backpack or a laptop case. This is a card camera reader adapter to use with the iPhone Xl; 8 Plus; 8; 7 Plus; 7; 6 Plus and the iPhone 6. The lightning camera kit can be used for the iPad Mini, the iPad Air and the iPad Pro. There is no need for any application to use it. It is compatible with iOS 9.2 and above. 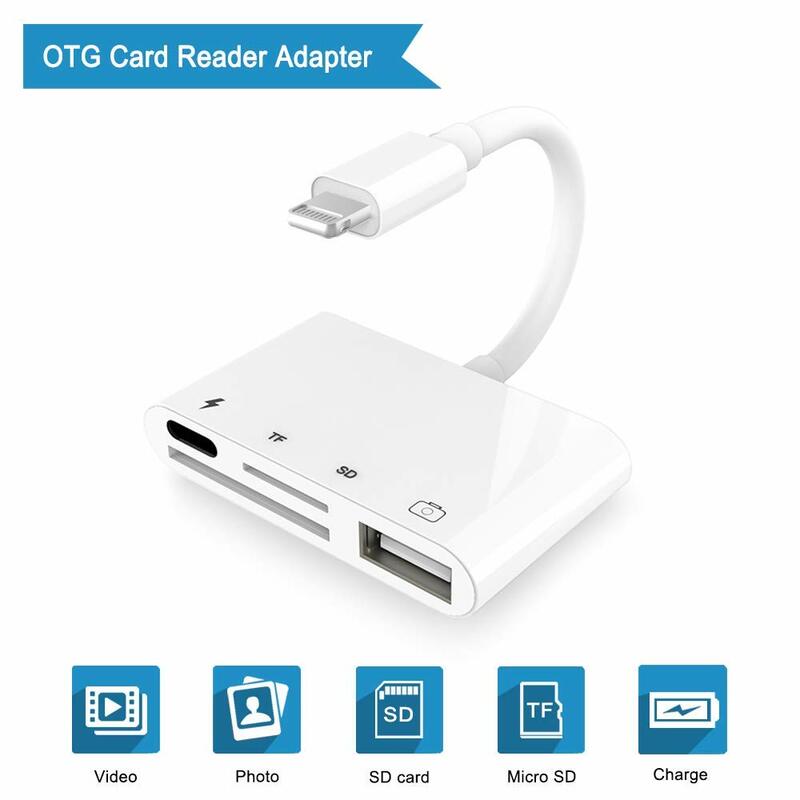 The adapter comes in a 4-in-1 design, which is the upgraded version of the 3-in-1 SD card reader adapter. There is an additional port for lightning charging; so, you don’t need to worry about being without power when transferring photos. The USB transfer speed is 2.0, so it is capable of transferring pictures and videos to the iPhone and the iPad anywhere. It can automatically open the Photos app when you connect it with the camera or the memory card. It offers support for JPEG/RAW formats as well as H.264/MPEG 4 video formats. It works on USB 2.0 OTG interfaces. You can use it to connect your iPhone or iPad to USB peripherals, such as USB Flash disk; USB hubs; keyboard; audio interfaces; microSD etc. The design consists of a bottom in a non-slip material with sides and front being smooth. The rear contains the plug for the existing Lightning Cable along with a headphone jack of 3.5 mm. The non-slip material keeps the dock in place, but you can also slide it around if you wish. You can use any iPhone that has a Lightning connector. You can also use it with the iPad Mini or a full-size iPad. However, the connector might not be able to bear an overload. 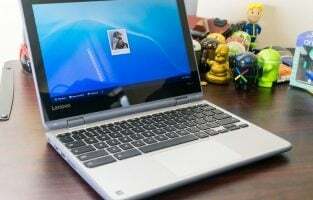 The width is no longer a problem, but a lot of bulk at the bottom will prevent it from the proper connection, it would be better to use a thin case. 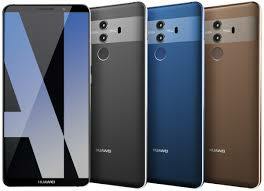 It feels niche and heavy to the touch with a tight connector so that it is slightly difficult to pluck the phone from it. It is very convenient as the phone sits upright when you are charging or syncing it. While using the dock, you can also unlock your phone using the Touch ID or a passcode. It is simple and easy to dock and suitable for a counter or a desk, even if you are using the iPhone in a case designed by Apple. It is a charging dock that is also compatible with a protective case over your iPhone. 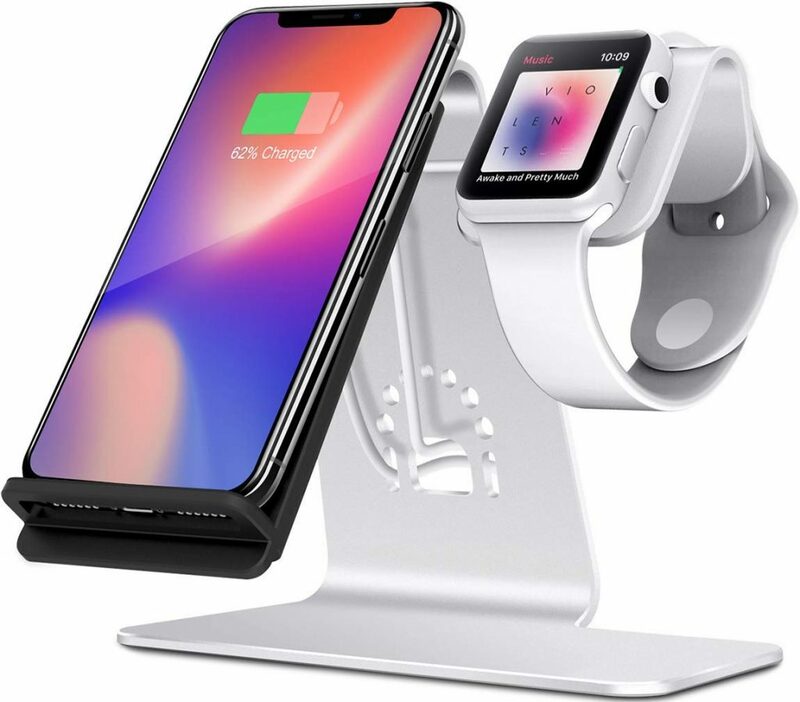 There are two docks present on it, one for your Apple Watch and one for an iPhone. You can also make use of the original USB cable that comes with the iPhone for attaching it to the station, which makes it very comfortable to place the phone on the stand. 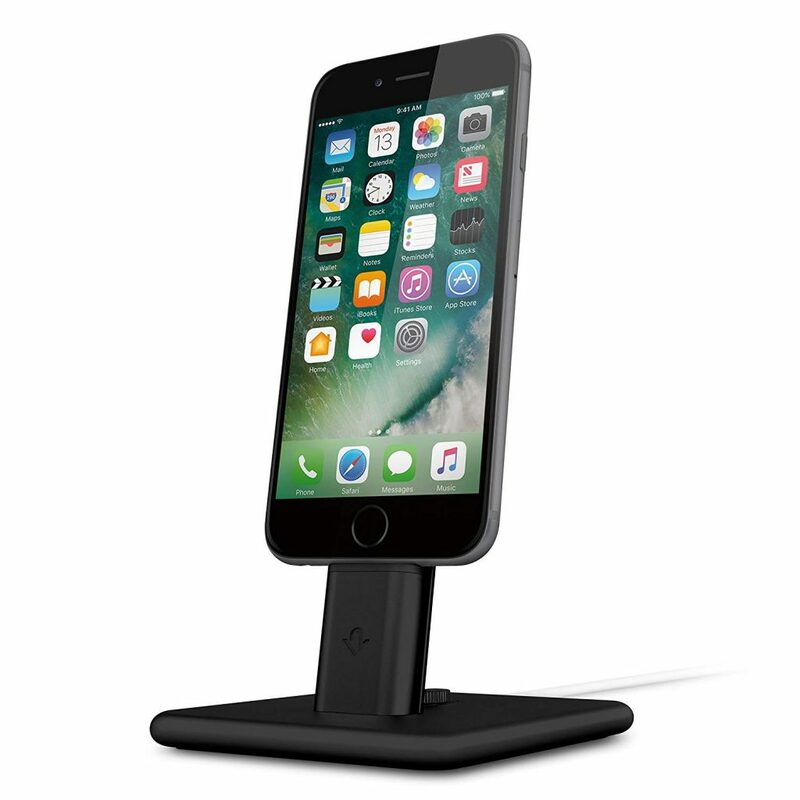 The iPhone stands upright and firm on the dock, so you can also play on your phone and use it easily while charging it. As for the Watch dock, it holds the Apple Watch very securely while charging it. It is compatible with all the versions of Apple Watch 3/2 series and Series 1, along with iPhones ranging from 5, 5S, 5C 6, 6 Plus, 6s, iPhone 7, 8, X as well as the iPad Mini and the Airpods. 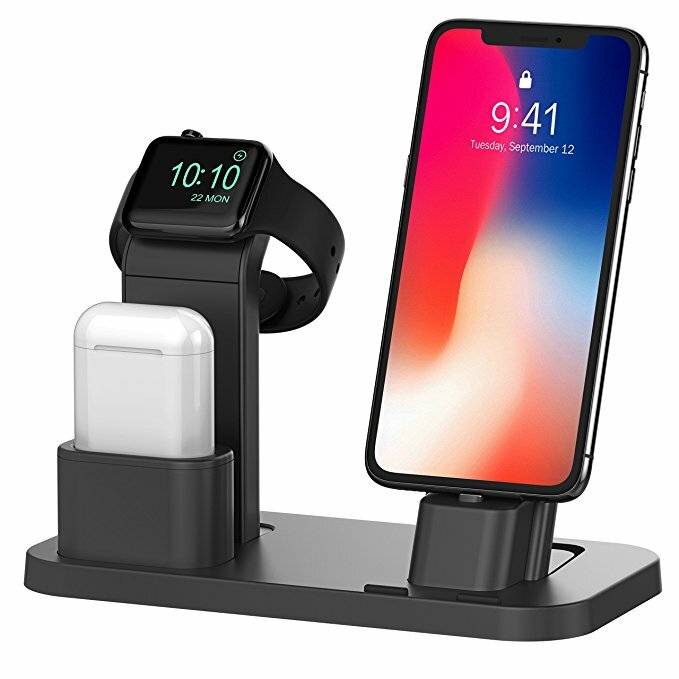 The stand offers an elevated position with a 45-degree tilt in case of the Watch stand so that you can see the time or use other features more easily in the nightstand mode. The charging stand for the iPhone showcases the device well. It is sturdy and offers the ability for a hands-free usage of Skype or FaceTime. It offers support for iPhone cases of various thickness, such as Spigen, Griffin Reveal, Otterbox and so on too. 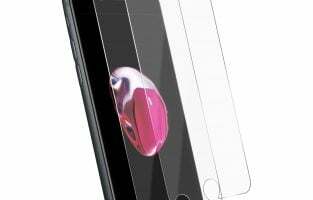 The design is a silicone spot one, enabling the iPhone to be kept horizontally so that the edges don’t get scratched and the content is not blocked. The grooves for the Airpods are well designed and fit perfectly. It is compatible with the original lightning cable of Apple devices as well as the 3 feet Lightning cable from Amazon Basics. Lamicall is well known for its great stands for phones and tablets and this one is suitable for both Android phones as well as iPhones. It is compatible with Android and iPhones that range from 4 inches to 8 inches, such as the iPhone 6, 6S, 7, 8, X. It is made of sturdy material and is well protected with rubber. The center of gravity is low and this makes it stable. The hooks come with rubber cushions on the bottom, thereby protecting the phone from sliding and from scratches. The height is perfectly suitable for viewing the phone and using it for FaceTime or YouTube while charging it. The material used is aluminum alloy, which looks simple, is lightweight and comes with smooth edges. The design makes it suitable for using it in the kitchen, a nightstand, a coffee table or in the office. The hooks are large; so, the iPhone fits in securely. You can also fix it easily along with a bulky or waterproof case on your iPhone. There is a cutout hole present at the back of the supporting bracket, which allows you to charge the iPhone without having to deal with messy wires on the table. The angle and height are perfect for using while charging, such as sending emails or reading messages, browsing the web and soon. 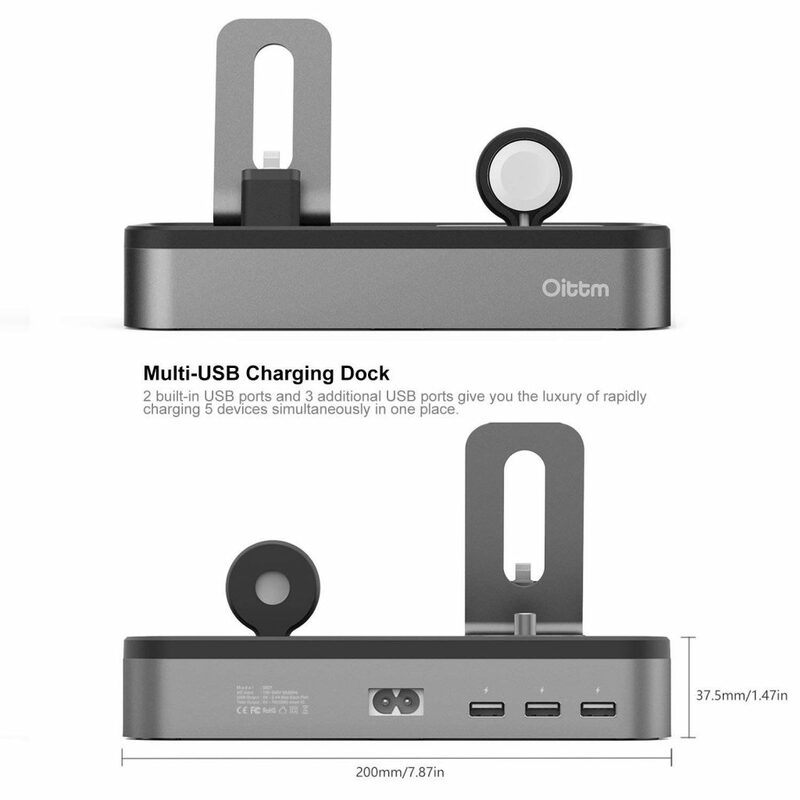 This is a desktop stand holder that is very efficient and offers fast charging features, using efficient components and advanced chipset. 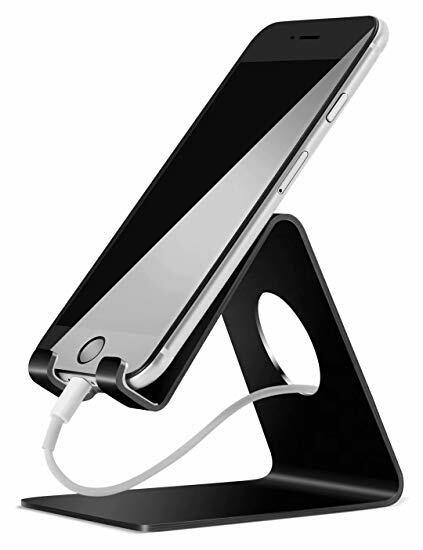 It enables both vertical and horizontal charging and can also be used as a stand for charging iPads and other tabs. It offers overheating protection and has been certified as safe to use. You can use the stand for charging all the Apple Watch series as well. It offers total protection against temperature, short circuit problems, overcharging, power and electromagnetic protection. It offers support for a maximum distance of 8 mm in case of using wireless charging features. 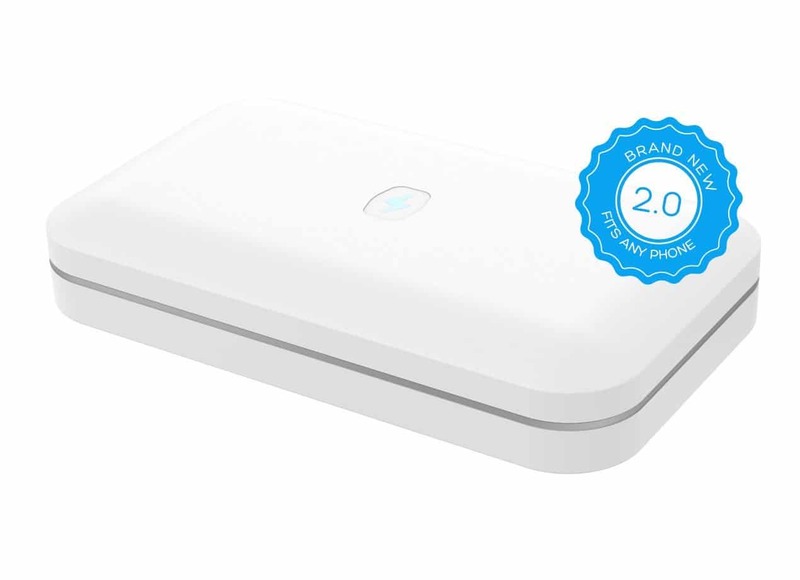 It is suitable for any other qi enabled device and is compatible with all Qi phones like the iPhone 8, iPhone 8 Plus and the iPhone X. You can also use it with non-qi enabled devices by using a Qi wireless charging adapter for powering it up. You can charge in vertical and horizontal modes and it offers the perfect angle for watching a movie, reading, doing FaceTime and so on. The design is in top quality of aluminum, which is capable of holding the device steadily. The cable cutout as well as an insert is convenient and prevents the cable from bending too much. You can keep everything well organized using this charging stand. 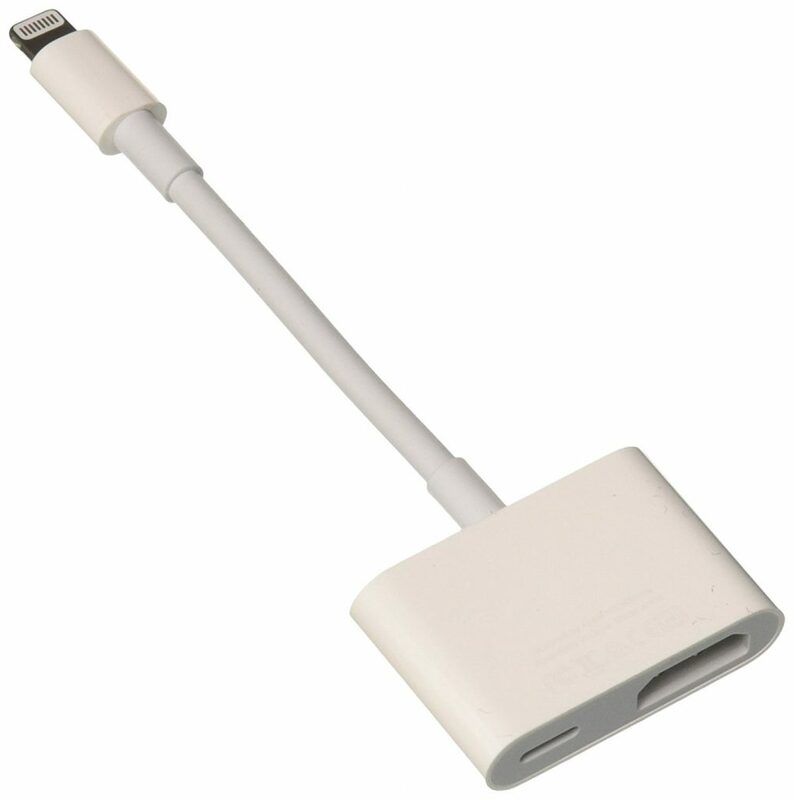 You can use the Apple Lightning Digital AV adapter with the iPhone as well as the iPad or the iPod with a Lightning connector. It offers support for mirroring whatever you display on the iPhone or your Apple device. This can be presentations, a website, a slideshow or any app. The display is supported on any projector or compatible display that is equipped with HDMI and is presented in a maximum Full HD resolution of 1080p. You can use the adapter for the output of video content, such as movies and television shows on to a big screen and watch it on 1080 pixels HD. You just need to attach the adapter to a Lightning connector on your iPhone or iPad and then connect it to a TV or a projector using an HDMI cable. It works with all iPhones as well as the iPad Mini, 2, 3, 4, iPad Air, Air 2 and the iPad Pro. 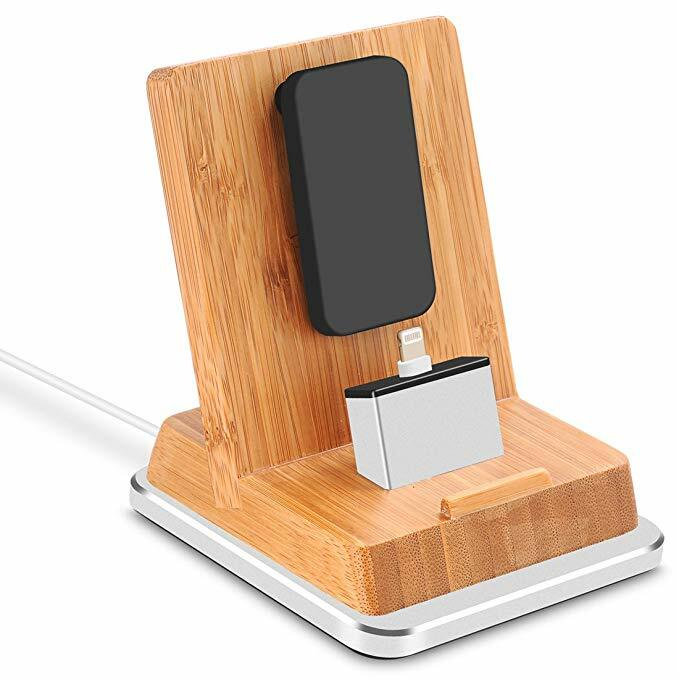 The footprint of this lightning dock has been reduced in this upgraded version from Twelve South, with the weight having increased this time around so that it is sturdier. It has several clips for adjusting the position of your iPhone or iPad, depending on the type of case that you are using. It consists of a dock made of aluminum, where cables can be managed at the bottom. It is quite heavy and sturdy. The design is refined and space saving. You can remove the iDevice easily with a single hand. The stand helps in elevating the device so that you can use it hands-free for making FaceTime calls or listen to music by pairing with your Airpods. The rear support can be adjusted and with the use of a matching clip, you can charge your iPhone/iPad without removing its case or shell. 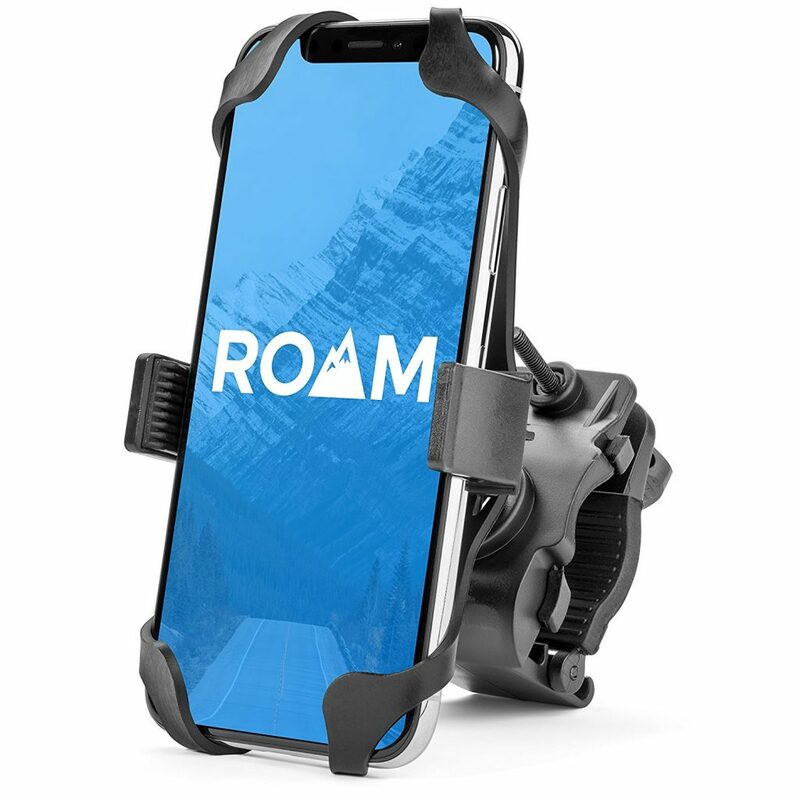 This is bike mount with a co-pilot that securely mounts the iPhone to the handlebars of your bike, with the use of a premium grip made of hard plastic and a silicone net. The device is securely held on to the mount from all corners. It is compatible with all iPhones, measuring from 3.5 inches width and above. You must measure the phone with its case on before you buy the mount. The mount can be adjusted to fit the handlebar size of your bike, ranging from 7/8 to 1 1/4 inches diameter. 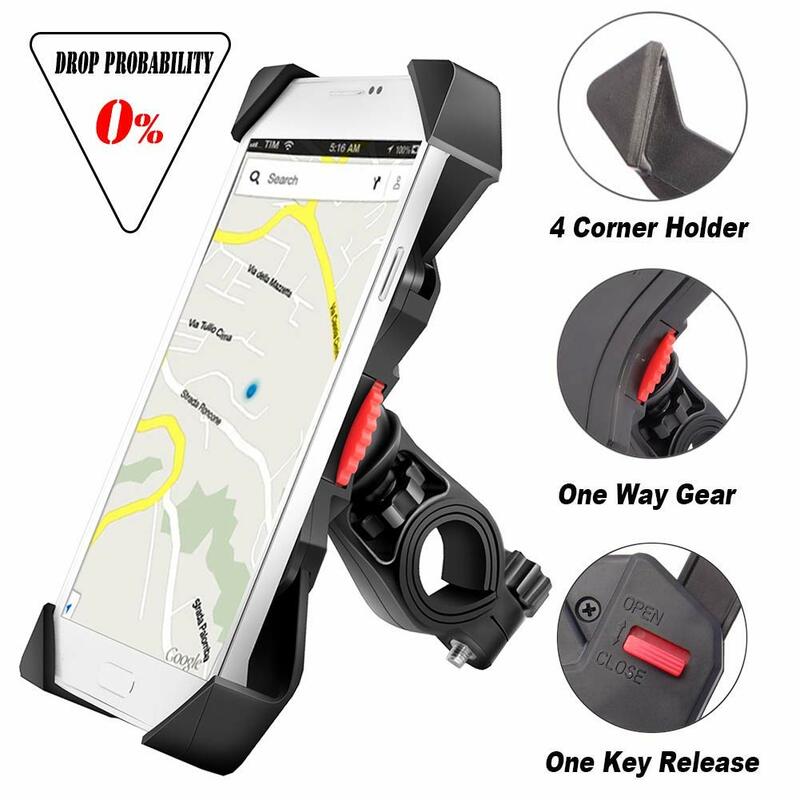 It makes use of 2 contact points for securely mounting your iPhone to the handlebars. The handlebar clamp is the largest one available in the market today and can fit a handlebar of any size. The plastic material is premium and strong and will not break easily. The silicone net material is also durable, unlike rubber. The material is also capable of stretching about 4 times its size and can secure the phone safely while you go on adventures on your bike. However, this co-pilot cannot be used with a sport bike that comes with clip-on handlebars. The screen is also visible throughout under all riding conditions. The VisNFA bike mount offers the greatest possible stability by holding your iPhone as securely as possible. It has been created with a smooth gear mechanism and can be easily installed without the use of any tools or any complications. The corners are sturdy and keep the iPhone securely connected with the bike. The locking switch is very convenient too. There are 4 supporting corners for the bike mount so that your iPhone remains well secured through the ride. It offers an additional security feature with an automatic locking feature having one way preventing of back gear, also preventing it from becoming loose during vigorous exercise. It is compatible with mostly all the iPhones, the iPhone X, 8, 8 Plus, 7, 7 Plus, 6S, 6Plus, and the 5S. 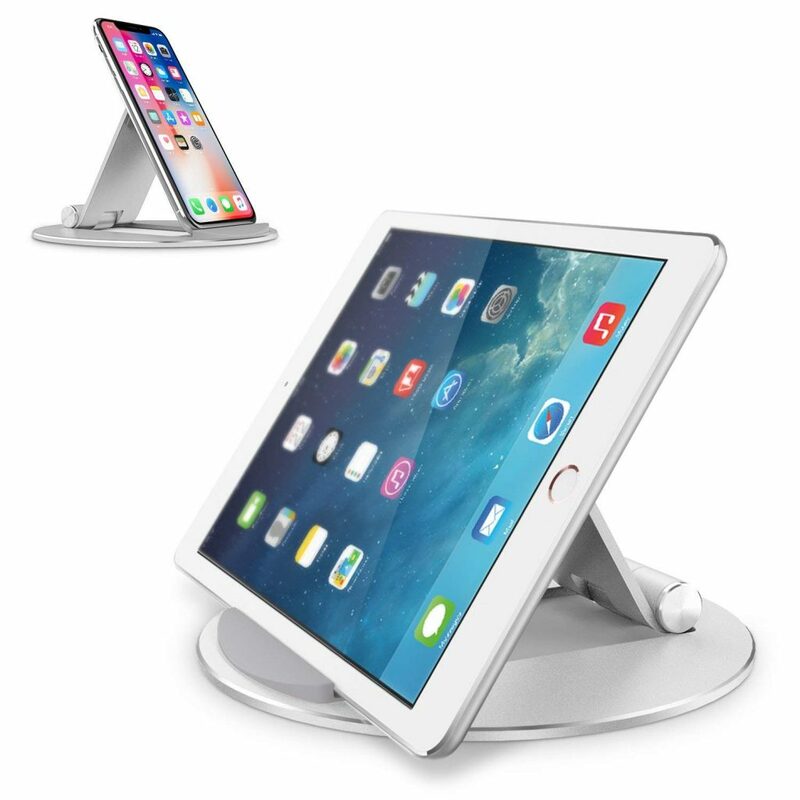 This iPad stand consists of a strong aluminum frame having padded grips in rubber, which effectively protects your tab from scratches. You can place the iPad either vertically or horizontally on this stand. 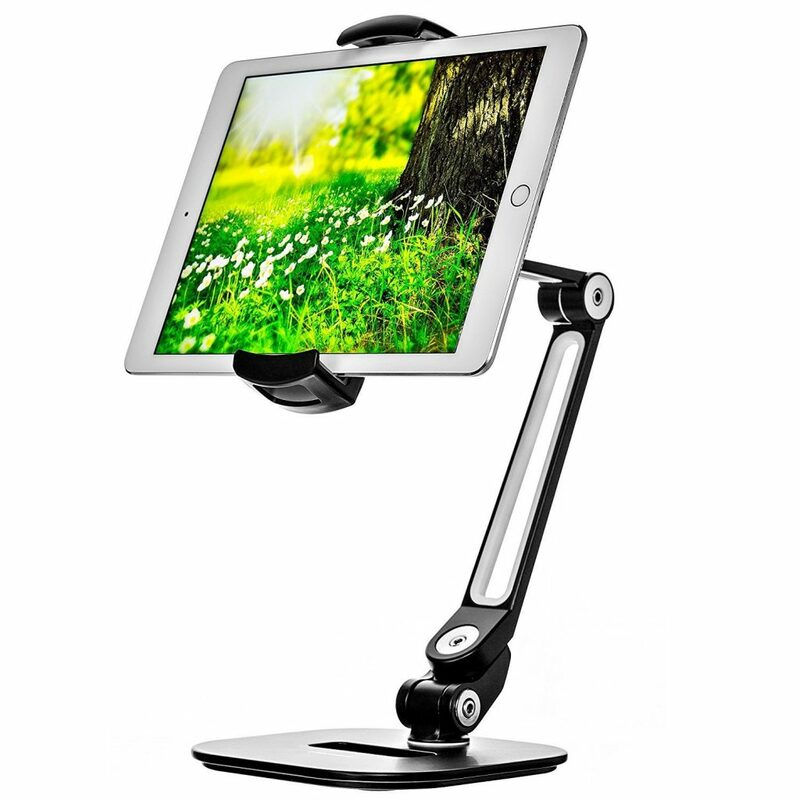 It has a swivel of 270 degrees so that you can adjust the stand to a viewing orientation of your choice. It is compatible with iPads and tablets that range from 4 inches to 11 inches in width. 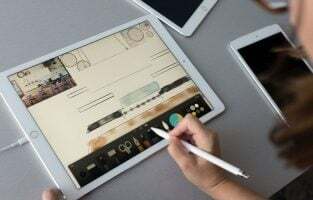 This means that it is compatible with the iPad 2017 Pro 9.7 and 10.5 as well as the Air Mini as well as the Samsung Tablet and the Surface Pro tablets. If the device is bigger than 12 inches in width, you can place it horizontally, as it works well in this manner. It is also lightweight and highly portable. The stand makes it perfect for playing games, reading or video recording using your iPad. The stand is made of a spaceflight, Al and Ti alloy. The alloy steel is super strengthened and lightweight at the same time. This iPad stand comes with a sticky base that makes it steady. It has silicone pads that are anti-scratch; so, it offers a good pivotal comfort for the iPad. It has been well designed to offer the most optimum viewing angles. The design is user-friendly and you can rotate it up to a maximum of 225 degrees. It has a sticky base that is created with material that is nano absorbent. This makes the stand strong and stable for your iPad. It is portable at 5.9 inches of diameter and you can easily put it into a bag or a large pocket. The base is unique in a round shape offering a steady, solid and sleek base. The rubber pads are non-slip and it has grip pads in the area where the iPad leans against it. There are 4 rubbers, which distribute the weight of the device symmetrically on the base so that the iPad will not slip from the stand. 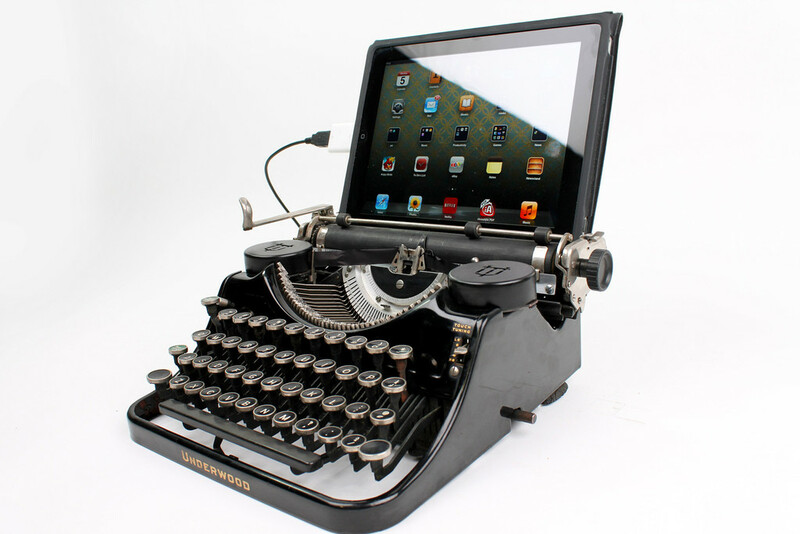 It is compatible with tablets from 4 inches to 10.5 inches, though with the case. It is practically a 3-in 1 and can act like a tablet stand for your iPad and iPhone as well as cameras. It has a rotational angle of 360 degrees, so you can position it in any way you wish and watch movies or play a game. 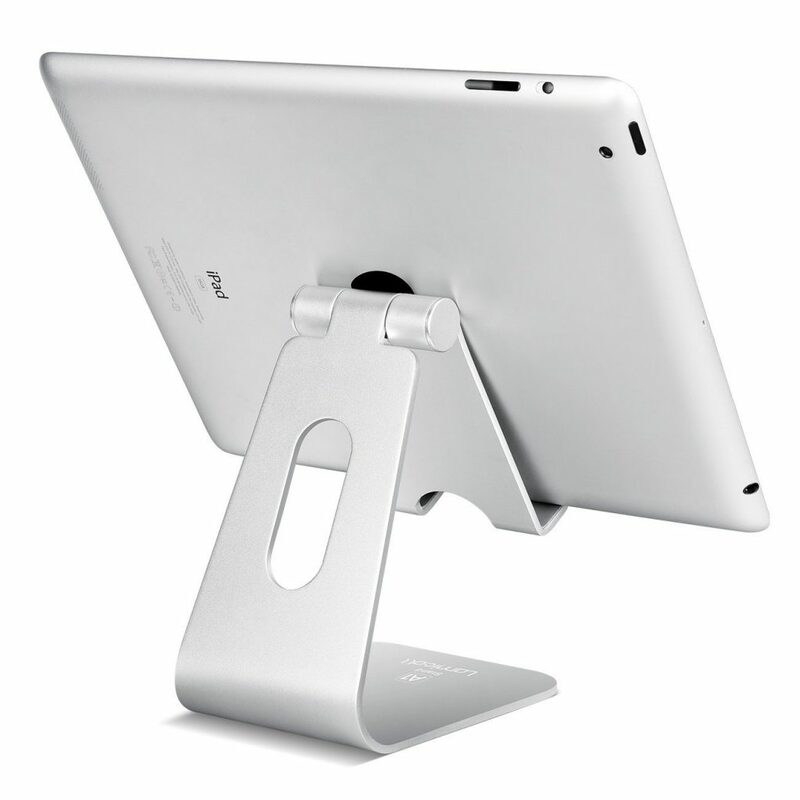 The design is modern and enhances the stability of the tablet stand, as the base is made of heavy aluminum. It has a height of 8.8 inches, a width of 5.9 inches with a minimum width of 4.5 inches and a maximum width of 7.9 inches for the tablet clamp. The maximum weight it can bear is 2.2 lbs or 1 kg. Its weight is 2.6 lbs. You can also use it as a stand for your camera or tripod. It is compatible with any tablet ranging from 7 inches to 11 inches. This is a multiple angle stand made in aluminum, which can be used for your iPhone as well as e-readers. It is compatible with all iPhones and smartphones ranging from 4 inches to 10 inches size. It comes with rubber pads, feet, which protect your iPhone from sliding off or from getting scratched. The pads can even be detached so that devices of different thickness can be held in the stand. It is a one-piece stand with a foldable design, which is portable and convenient to carry around. The multiple angle makes it suitable for watching videos or reading or just for browsing the web. 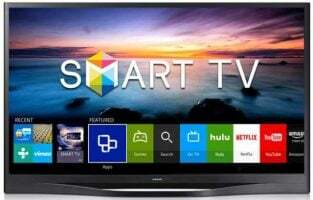 It can be adjusted to 9 different viewing angles, by just pressing a button, so you can easily set the right viewing angle. It is made of a sturdy aluminum body that weighs just 3.6 ounces, but it can bear a weight of up to 11 pounds. The dimensions of the stand are 3.9 inches x 3.5 inches x 0.8 inches. It is compatible with all Apple smartphones ranging from 4 inches to 10 inches, as well as for e-readers and other tablets. It is similar to a console gamepad using the Sony Dual-shock layout. It is a great MFi controller for your iPhone and iPad.The unit is comfortable with a pleasant matte surface. Since the charging ports are at the rear, you can play even when it is charging. It allows for 40 hours of play time. The analog sticks and triggers are excellent with face buttons being most responsive. 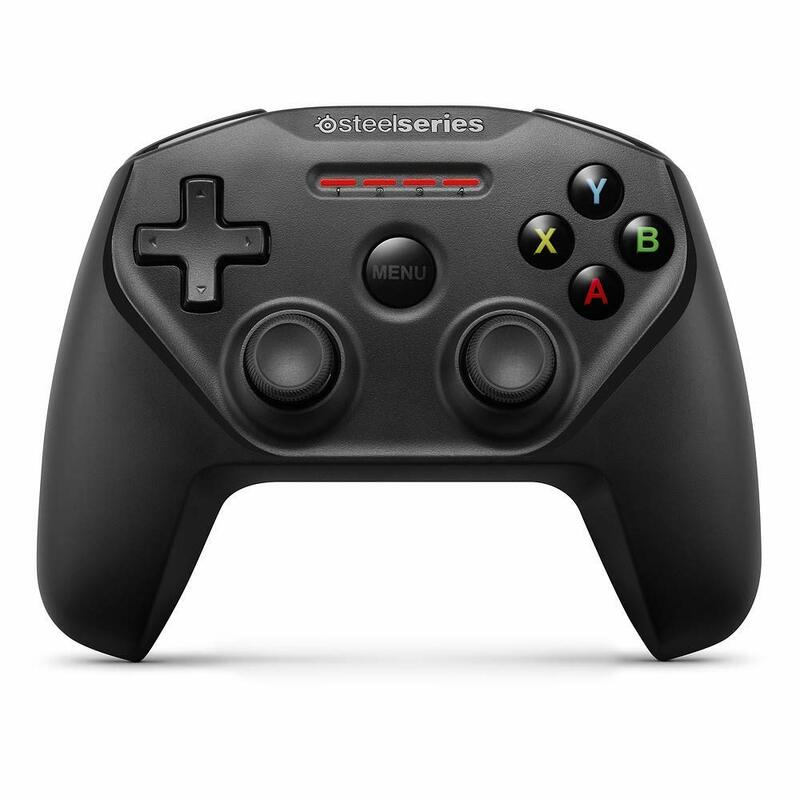 The buttons are pressure sensitive and enable precise control over gaming. It is compatible with the iPhone X, iPhone 8, 8 Plus, iPhone 7, 7 Plus, iPhone 6S, 6S Plus, iPhone 6, 5, 5C and 5S as well as the iPad Pro; the Mini; Mini 4; Mini 3; Mini 2; Air; Air 2; iPod Touch 6th gen, Mac and Apple TV 4th gen. The setting up is simple and straightforward with Bluetooth pairing just taking a few seconds. You can use a single Nimbus with several iOS run phones and devices and even with a Mac. This is a multiple function charging dock for your iPhone as well as iWatch. The dock or stand allows users 2 additional USB ports; so, that they can charge some other device as well. It consists of a plastic cylinder with aluminum wrapping, being 9 cms across and 11 cms in height. On the top, there is a square hole, into which one of the 3 charging adapters have to be fitted, in accordance with the device that you want to charge. There are 3 additional USB ports on the front, with each delivering 5V/2.4A and a maximum of 6A. There is no fast charging feature. The back is to be plugged to the mains. It is made from high-quality bamboo material with an aluminum base. It is solid and sturdy and has enough weight to make the stand stable. The bamboo and aluminum offer an optimum charging experience. 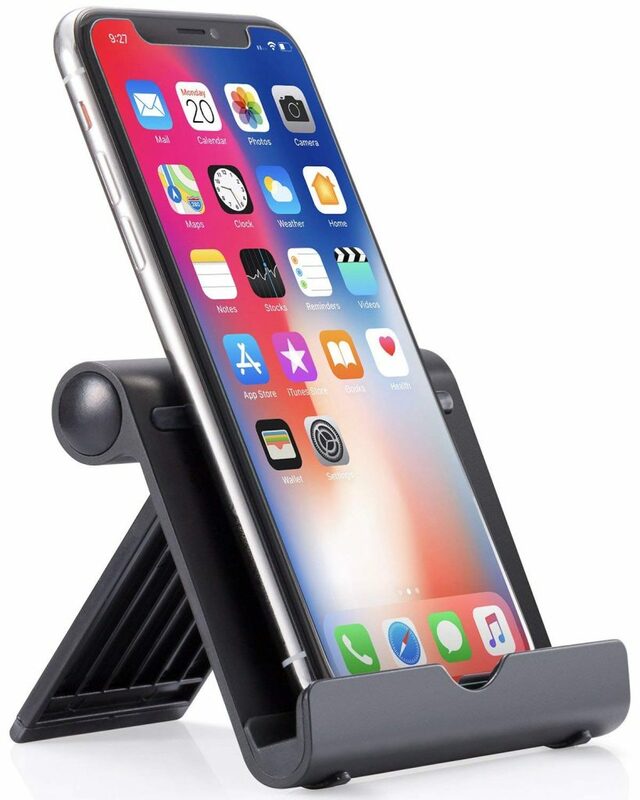 You can rest your iPhone or iPad on it and also use it as a display stand for watching YouTube, FaceTime, browsing the net, etc. using it in either vertical or horizontal orientations. Viewing angles are excellent and comfortable. The size is adjustable to suit different iPhones with different sizes of cases. The backrest can be adjusted easily using screws to suit different thicknesses of cases. It also comes with a lightning cable of 3.3 feet. It takes just a few minutes to set the charging stand up and use it. Do you know a classic foosball game? Have you every played it? You can download foosball game app on your iPad but it will not feel the same. 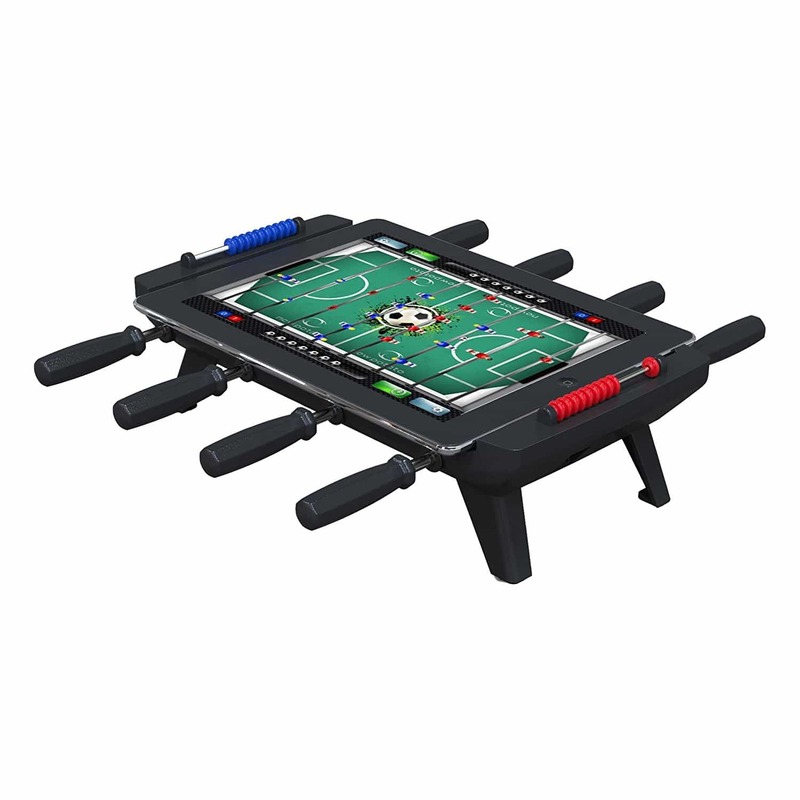 There’s an additional accessory from a third party company to give you experience in playing a classic foosball game on iPad. iPad Foosball provides just the right combination of real-world, tactile experience with digital enhancement. Four spinners on each side with comfortable grips spin and shift in and out, controlling the digital players on the field. Sliding colored markers at each end keep track of the score, and the rubber feet on the table’s legs keep things stable during the action. Its price starts from $59.95 and it’s compatible for iPad 3, 4 and Air. Do you know that your iPhone has 18 times more bacteria than a public restroom? What should we do to sanitize our iPhone? Thank God, iPhone has its sanitizer named Phonesoap Sanitizer. It’s easy-to-use iPhone charger and sanitizer, and you can use it to wipe out most of those germs with ease. Simply place your iPhone inside, attach the charging cable, and close the lid. Exterior lights let you know when the iPhone is charging, and when the cleaning is complete. Inside, a pair of specialized, ultra-violet lights will do the dirty work for you. It has acoustic Audio Amplifier which allows you to hear notification while your iPhone is sanitizing. It costs $54.95. 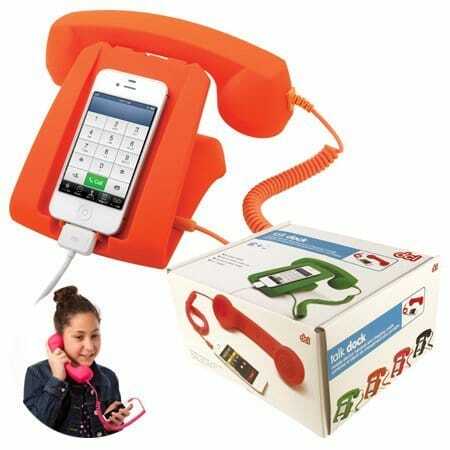 The Talk Dock Phone Set is a retro, 2-in-1 styled phone dock and handset with a handset that stays cool during use. Acting as a dock, charging station, and receiver all in one, the Talk Dock lets you charge your phone, talk to your friends, and finish your crossword all at once. You can get this retro style telephone receiver for only $28.45. You can do a lot of things with your iPhone indeed, including playing games. There are lots of interesting game apps you can download from App Store, but things can be a lot more interesting with this iPhone game controller. 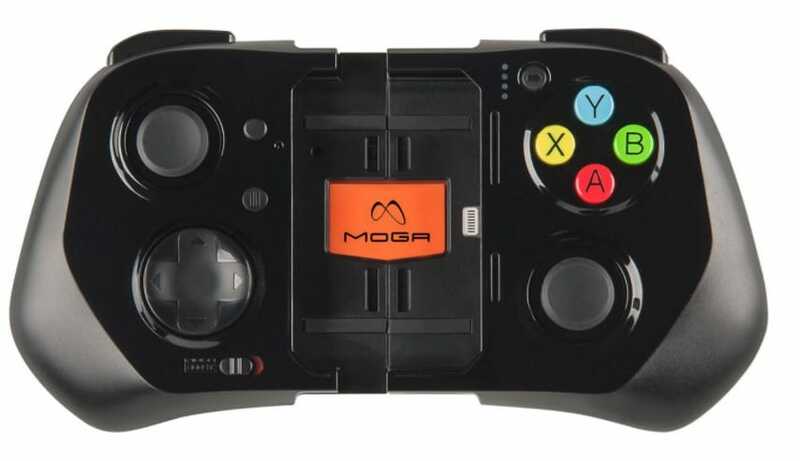 With a design and button layout inspired by traditional console controllers, MOGA offers a much finer level of control than your mobile device’s touchscreen. With the controller’s dual analog thumbsticks, you’ll enjoy a competitive edge in first-person shooters, racing games, platformers, and other mobile games that call for quick, precise control. Many Apple users who have an iPad or an iPhone like to buy accessories for their phones, to make their device more functional and cool and to give it better protection as well. 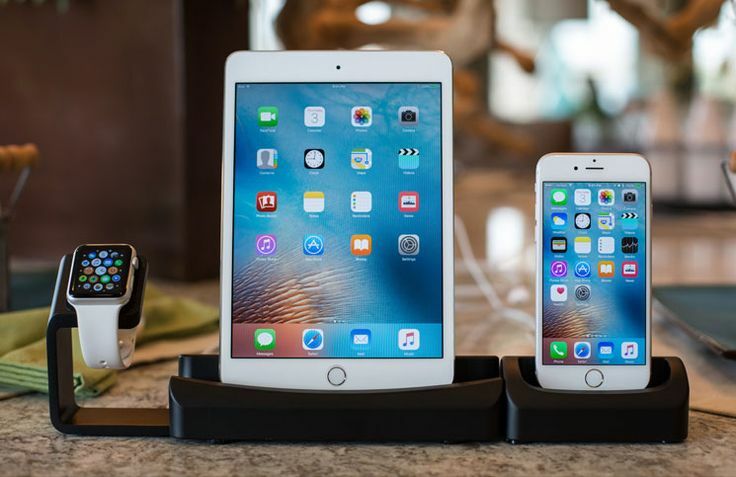 The above list of products is a mix of stands, charging docks and so on, that you can use with your iPhone or iPad. They are all interesting accessories and can be a great value addition to your iPhone or iPad.